Five years ago, when American Airlines Flight 11 and United Airlines Flight 175 tore into New York's Twin Towers at 8.45 am, on a sunny morning and brought down both buildings 103 minutes later, 41 Indians lost their lives. Many other Indians saw their future take a different course after the tragedy. They nursed the wounded, aided the victims' families and helped the the US government in the aftermath. To mark the fifth anniversary of 9/11, in a week-long series, rediff.com brings to you the stories of some of those Indians for whom September 11, 2001 changed their lives forever. Today: He died. She killed herself. When she learnt that her husband was one among the passengers on the ill-fated American Airlines Flight 11 that slammed into the North Tower of the World Trade Center on September 11, 2001, Kalahasthi Prasanna's contract with the world ended. It took her another 37 days to formally part ways with a world she no longer wanted to live in. Five years on, friends of the family still battle guilt, sorrow and anger when they recall how Prasanna ended her life -- she hung herself from a rope strung from a chin-up bar in her apartment. Vamsikrishna Pendyala, Prasanna's husband, never knew what it was to have an easy life. Son of a technician at Avadi, near Chennai, India, Vamsi -- as his friends call him -- relied on hard work to find his way into BITS, Pilani, Rajasthan, one of India's premier engineering colleges. That is where he met Ronnie Verghese -- in the queue of people registering for courses. Vamsi was an average student, but by dint of hard work ensured that his grades were always steady. "He was really struggling to get the money," Verghese recalls. "He borrowed money, he wanted to go for higher studies, to get a better life, improve the lot of his family." Verghese partied while Vamsi slogged; it was Vamsi's meticulous note-taking that helped Verghese pass his exams. The two friends then held internships at the same places and kept in touch until, in 1992, Vamsi decided to study in the US. He worked at a petrol pump station there so that he could continue graduate school at the University of Missouri, Rolla in the Midwest. He was working on his thesis there when he got a job at Monsanto in Missouri. He gave up on graduate school, but then Monsanto laid him off. "He found a job in Houston and was working there," Verghese says, of his friend's life between 1994-1995. It didn't get better in a hurry. 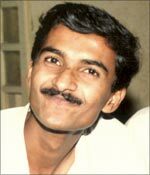 Vamsi scrounged money together to buy a used sports car -- a Nissan 350 ZX -- to get to and from school. Came a day of unusually high rain in Texas, and his car was totalled. "He lived his life with great difficulty," Verghese recalls. "I've seen him live in Houston � on Thair Sadam (yoghurt rice) and pickle. He could not afford anything else. He never let his family know what was going through, though. "He wanted to make sure his family didn't suffer." And then, things seemed to change, for the better. He found jobs in Los Angeles, and ended up as a project manager for the consulting firm DTI. He went back to India to attend the marriage of his brother Srinivas -- and his eye lighted on his sister-in-law's cousin, Prasanna. The two families smiled benignly on what, despite their approval, could be deemed a 'love' marriage. Despite the usual immigration problems, Prasanna joined him in Los Angeles and began training under a dentist so that she could join the dentistry school at the University of South California. As a project manager, Vamsi's job involved a lot of travelling. In September 2001, he went to Boston for what he thought was a quick job, but had to stay on to deal with another project. He was to return that weekend, but got held up by another project. Verghese recalls a conversation with Prasanna, in which she told her husband's friend how she had asked him to come home that weekend -- e could go back again if needed, she told him. Vamsi, whose life was lived on the twin principles of dedication and hard work, decided that he would rather work on the project through the weekend, and then return. On the morning of Tuesday September 11, he and a friend rushed to Logan Arport in Boston. He was the last person to get on board American's Flight 11 to Los Angeles -- and he likely considered himself lucky to have squeaked through in time. As Vamsi rushed through the airport lounge and towards the departure gate, Flight 11 had already begun boarding -- and walking into the aircraft were, among others, Mohammad Atta and Abdulaziz Alomari. 'Hi, sweetie, I've just boarded the flight, and I'll see you in Los Angeles this afternoon' was the message. Neena Mukkamala first met Prasanna during the interview at the USC College of Dentistry in Los Angeles. "There were 30 Indians in our class. We were the only two Telugu people," she recalls. They were classmates and, separated from each other by one student, worked in the same laboratory. When the lab work ended at midnight or later, Prasanna used to drop Neena home before driving to her own apartment on Catalina Street, downtown LA. Because Neena's husband was in Delaware then and Vamsi was often away, the two found time to bond, discussing their husbands, family and the school work that ruled their lives. "She was a very nice girl," Neena recalls. "She was outgoing and very friendly with everyone. "Her husband used to go to work at different places. She was my main friend there. He used to be a good man, too. They were more like friends than wife and husband." It was during their second semester together that Vamsi began working in Boston. On September 11, Prasanna called Neena. "She said something about the flights," says Neena. By then, the planes had struck the WTC, and the horrific images were all over the television screens. Prasanna, however, did not know which flight her husband had taken. She bunked school and stayed home, waiting, hoping. 'I am getting scared,' she told Neena. Verghese, meanwhile, was calling around to see if all his friends were safe. "I sent an e-mail to all my friends," he recalls. "I left a message with Prasanna. "She called after a day or so to say he (Vamsi) was on Flight 11." Her friends never saw Prasanna collapse; they never saw her break down. "She was all upset." Neena recalls. "But she has this thing, she would not cry in front of other people. She was like a coconut: a hard shell, and soft inside." 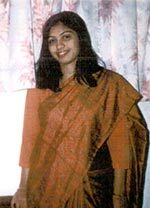 "She was the bindaas type, a very strong person," Rajiv Patel, president of the class of 2003 at USC, recalls. "It was very surprising." Prasanna refused counselling; she told her friends she was alright, that she would get on with her life. Neena kept calling her, meeting up with her, but Prasanna increasingly preferred spending time with a senior, one who had earlier lost her first husband. 'I want to talk to Neena, but she gets more upset than me,' she told the senior student according to Neena, who admits she was more prone to breaking down than Prasanna. Neena recalls classmates asking her, is she okay? Why is she not crying? Her father, brother and father-in-law had all come over; Neena had started attending classes again. Friends like Verghese and Neena, and Nadadur Kumar, then associate director of the office of international services at USC, were increasingly confident that Prasanna would recover from the tragedy, would eventually become whole again. There were subtle signs, though, of the tragedy in the making. In separate conversations, Prasanna told the senior student, and Verghese, about one time when Vamsi joked about what she would do if he was not there. 'I'm not going to stay without you,' Prasanna said she told her husband then. Was that the sort of thing young couples tell each other? Was there, in her retelling that story not once, but twice, a hint of what she intended? The senior student, who for personal reasons did not want to be named, recalled Prasanna asking if it was possible to buy in stores the (poisonous) solvent they used in laboratories; the explanation was she wanted to clean something at home. There was also, for those looking for straws in the wind, the fact that her sister in India had earlier committed suicide. Verghese called Prasanna October 18. She was not in a mood to chat, Prasanna told him. She told her brother to go visit relatives in Chicago. October 19, Neena noticed that Prasanna had not come to school. When she recalls that day, she unconsciously shifts into present tense -- for her, as for all friends of the couple, the immediacy of the tragedy has not been dimmed by the passage of time. "She's not calling back; something's wrong," Neena recalls. After multiple calls to Prasanna's home, Neena called Rajiv Patel at the International Dentistry Program, and asked him to come over to Prasanna's house. "The house was locked," Neena recalls. "There was a sari or comforter hanging outside her window. The car was there." That worried Neena -- Prasanna could not have gone anywhere at all without it. Rajiv and Neena stood outside the door, and tried Prasanna's cell phone. They heard it ringing inside the house. The lady who was taking care of the property would not open the door for them. "She suspected something was wrong. She called later. I went there during lunch. I guess she called the cops," Neena recalls. She called Bob Taylor, deputy chief of the department of public safety at the university. "We notified the LA police department," says Taylor, now chief probation officer of the Los Angeles County Probation Department. "We worked with them, confirming that she was a student of the university. "She had committed suicide: she hung herself." In the apartment, the police found a receipt, dated October 15, for a length of rope. Beside her was a letter from then New York City Mayor Rudolph Giuliani, inviting her to a memorial service scheduled for October 28. Neena did not enter the apartment -- she could not take that final look at her friend. "I didn't see Prasanna," Neena recalls. "I didn't dare go into the house; my friends would not let me." The words stop. Memories, still fresh after five years, well up as tears. Rajiv Patel, too, did not see the body. "We were fortunate in having good memories," he says. "If we had seen that, it would have stuck in our minds." "When someone commits suicide, one of the first things you feel is, 'What a loss, what a tragic loss of a human being,' says Taylor. "When it's someone like this -- young, attractive, vibrant, intelligent -- you just wonder if there was some way to reach her, to understand her grief." The incident shocked the student affairs department; its members began outreach efforts to see if there were other people who had been badly affected by 9/11, and who were silently struggling with the terrible wounds to their psyche. Soon after the tragedy Venu Palaparthi who, like Vamsi, was an alumnus of BITS-Pilani, brought together a group of people to endow a fund in his memory. Finding that they were not qualified to collect funds, the group put together the BITS Alumni Association, which now has 16 chapters. "We owe our entire organization to Vamsi," Venu says. "In dying, he created an organization." BITSAA has now raised $ 1.5 million for the cause. Nothing they have done has managed to assuage the feelings of guilt. And so, even today, Neena wonders if there is something she missed, some sign she should have picked up on, something, anything, she could have done to prevent the death of her friend. Should she, perhaps, have stuck with her, refused to leave her side? Would that have meant the young widow would still be in the land of the living, attending classes, talking again of hopes and dreams? For Verghese, it manifests as anger. "I was kind of pissed off," he says. "We are the guys who are supposed to help. I kept thinking everyone's there (with Prasanna) and it's fine. I was kind of pissed off that I'd screwed up." The words trail off into prolonged silence; Verghese retreats into a place of grief no outsider can fathom, no words can bridge. Sub: no body questioned them..